When I was first learning to cook, I used to cook tacos all the time. I’d buy those little packages of seasoning mix and supper was figured out. The convenience was awesome. Then, I was just poking around Allrecipes a couple of years ago, and I saw “Taco Seasoning I” on the sidebar. I was totally intrigued, and made it that evening. I already had all of the spices for it, but the big question was did it taste as good as the seasoning packets I was so used to? 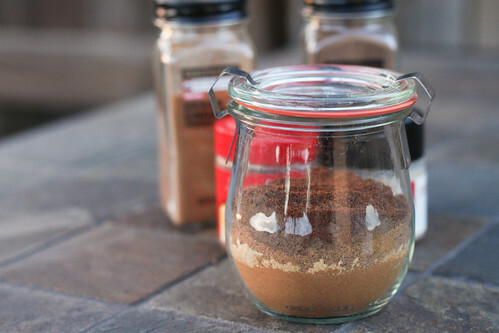 I love the idea that I can make my own taco seasoning, and the spices required for this particular one features fairly common spices. I also love that I know exactly what is in my taco seasoning, not to mention that it’s much cheaper to make this seasoning on your own. I don’t use this for just taco seasoning. I also tend to use it when I make fajitas, I sprinkle a little bit in the blender before making salsa and use some of it when I’m making a quick salsa slow cooker chicken. It’s such a good seasoning blend for standard tex-mex dishes, in my opinion, and couldn’t be any simpler to throw together. 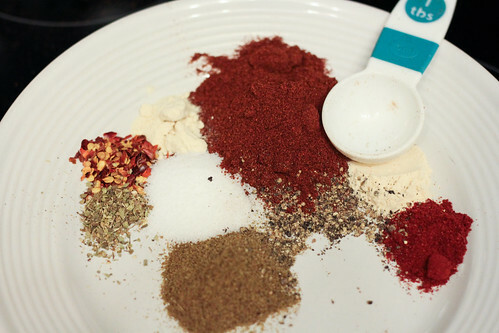 Add all of the ingredients to a bowl and mix them together, until the seasoning mix is well blended. Store in an airtight container. My husband and I like to make our weeknight cooking as simple as possible. Just lately, we got into making tacos, but were shamefully using the kits for tacos and mexican rice. After finding this recipe for Taco Seasoning on Allrecipes, I decided it was probably worth a shot to do this without the kit. Not only did we have all the spices on hand, but because it was a mix we made, it felt a little more homemade with not much extra effort! For the side, I wanted to try something a little different, so I searched for ideas with mexican spiced potatoes and after looking at many ideas, I found a recipe for us to try. These potatoes had a nice flavor, but I was hoping for more of a kick with them. So, next time, I’m going to probably adjust the spices a good bit or even try putting some of the Taco Seasoning in there with the recipe. Combine all of the ingredients, except the potatoes and lime in a jar and shake to thoroughly mix ingredients (or whisk in a bowl). Pour your diced potatoes into a jelly roll pan, and toss with the oil mixture. Sprinkle with salt and freshly ground pepper. Roast for about 40 minutes, until the potatoes are well cooked, and browning on the edges. Take out of the oven, and sprinkle the juice of one lime over it. Taste test, and add more lime juice or salt, if needed and serve. 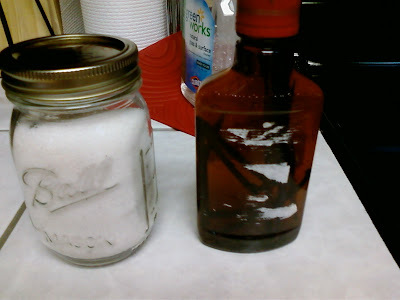 Check out my vanilla extract after a little over 2 months later…I made two batches…one for my family’s house and one for my fiance’s house..it looks great and I can’t wait to bake with it!! See the extract before a good 2 month soak here. I’m gonna keep the beans soaking in there for longer, but that rich amber color shows me that it’s already ready!! My newest project with these fine beans is making some vanilla sugar for gifts around the holidays. Target was charging $1.99 for maybe 3 oz. of vanilla infused sugar, and with so many uses for it, I’m sure it will be a great gift for the coworkers…I love giving homemade items. Last year was truffles and pretzels (which I’ll probably continue anyway)…but I want to add vanilla sugar to the mix with some fun recipe ideas! I followed Culinary Concoctions proportions for the vanilla sugar in her post here. These vanilla beans are so long, and amazingly easy to get the seeds out of. Look at how gorgeous these are. It seemed like the average was 5 beans/pint of vodka (tons of recipes on the internet), so since this is a half pint, I used 3 beans. To extract the seeds from a vanilla bean, all you have to do is slice the bean all the way down, then take the blunt part of the knife and run it on the inside, scraping the seeds off the bean. Easy right? Place the seeds and scraped bean leftovers in the vodka bottle. After it’s all sliced and scraped, close the vodka and give it a good shake.